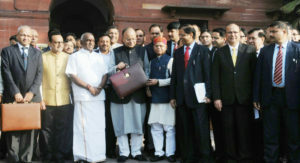 The Union Minister for Finance and Corporate Affairs, Arun Jaitley departs from North Block to Rashtrapati Bhavan and Parliament House, along with the Minister of State for Finance and Shipping, P. Radhakrishnan, the Minister of State for Finance, Shiv Pratap Shukla and the senior officials to present the General Budget 2018-19, in New Delhi on February 01, 2018. Industry leaders have responded favourably to the budget. We bring to you their views on the Union Budget 2018-19. Government of India is strengthening its digital presence to increase efficiency and transparency in the way citizen-centric services are provided which would require huge investments in IT. We see a lot of business opportunities in the Education and the Health sector this year as the government has increased digital intensity in education and taken healthcare to the new aspirational level with the flagship National Health Protection Scheme or Modi Care. The government has also reduced the tax rate to 25% for companies with a turnover of Rs. 250 crore, empowering medium-sized companies to make large investments in hiring and innovations and become a part of the Digital India movement. These new digital initiatives would require support from players like us to drive the vision into reality. “This is a budget for the masses due to several reasons. Firstly, 10 crore families will receive health insurance cover. Secondly, thrust on education by teachers’ training on a mass scale. Thirdly, agriculture has been encouraged and focus would be given to double farmer income by 2022. We also welcome the measures that the Government of India plans to undertake to hasten India’s movement to a digital economy. There will be significant use of Aadhaar numbers even for the businesses, as all business entities will be allotted an Aadhaar like unique ID number. The Government has also announced various benefits for students and the education sector in India. This will give focus to digital boards. Allocation of 1 lakh crore rupees in promoting learning based outcomes and research sector will give a further boost to education sector. The Wi-Fi hotspots, New Smart Cities, internet connectivity, investments in Telecom infrastructure and Digital India expansion is going to witness proliferation of online devices, and the hyperconnectivity towards which India is heading needs to be secured with a very sound cybersecurity policy. Data Protection is a top priority, and a security approach that leverages the power of automation, integration, and strategic segmentation backed by threat intelligence are critical to the implementation of the above programs. The collective brilliance that the digital and cybersecurity communities have amassed in our country is staggering—with each new generation poised to push us further. At one time, we were challenged not to ask what our country could do for us but what we could do for our country. It is time that the leading organizations in digital technology come together once again to ask the same ‘what we can do for our country’ to protect our new digital empire.